Li Keran (李可染, 1907-1989) was a painter and art educator, who was a prominent figure in 20th-century Chinese art. He developed a personal style of landscape painting that was based upon the emulation of both ancient and contemporary masters. Li showed a gift for painting, calligraphy, and music as a child. 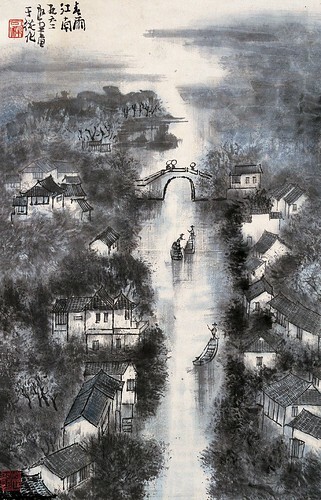 When he was 13, he began to study landscape painting with a local painter. 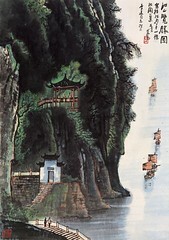 In 1923 he entered the Shanghai Art College, studying both traditional Chinese painting and Western art. It was during this period that Li attended three lectures given by Kang Youwei (康有為), who advocated learning from both Song academic painting and from the realistic tradition of the European Renaissance. Kang’s ideal of merging Eastern and Western art to create a new century in Chinese painting inspired Li greatly and became his lifelong pursuit. In the spring of 1929, Li was admitted as a graduate student at the Hangzhou National Art College, where he studied drawing and oil painting under the French teacher André Claudot. During this period he developed a kind of abstract and structural style in his oil painting that showed the influence of German Expressionism. In 1932 he became a member of a leftist art organization, the Yiba Art Society. That same year he left school and returned to Xuzhou, where he had his first solo exhibition. 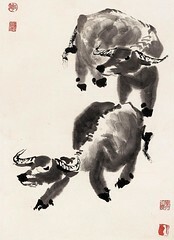 From 1934 Li began to experiment with figure painting in ink and wash. During the period after the Sino-Japanese War, he began to paint cowboys and water buffalo, endowing this traditional subject matter with new significance by his use of an innovative technique of splashed ink. 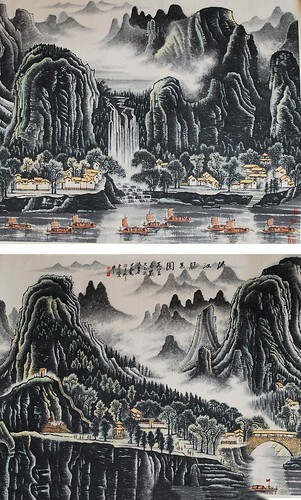 Appreciation of his work, especially his figure paintings, grew, and in 1946 he accepted an invitation by Xu Beihong (徐悲鴻) to join the faculty of the Beijing National Art College. There the masters Qi Baishi (齊白石) and Huang Binhong (黃賓虹) became his mentors. Qi, fond of Li and his painting, applauded him as the most important painter in the post-Qianlong-Jiaqing period. After 1954 Li spent much time sketching from nature, claiming that drawing was the first step towards a reformation of Chinese painting. While he emulated ancient Chinese calligraphic traditions, his rigorous training in oil painting also taught him to apply Western elements, such as chiaroscuro, to his work. He is thus remembered as neither a traditionalist nor a reformist, but rather as a pioneer who blended these two trends in 20th-century Chinese art. In his later years, Li attracted many students and followers, who formed the “Li School” of the 1980s.